Information is still coming in about the crash of the Polish Tu-154 at Smolensk with President Kaczynski and a good part of the Polish government on board. There seems to be an organized effort to blame the pilot for the crash claiming that President Kaczynski pressured him to land under impossible conditions. Assuming the Russians did let a city that large run their airport on “visual flight rules” raises the question: Why would anyone ever want to land there? If I were planning an important event, where people had to fly in, I’d only recommend an airport that had an ILS. In this case, there was an airport at Vitebsk in Belarus with an ILS that was only 66 miles from the Katyn forest. To safely land an airplane under Visual Flight Rules (VFR), the minimum safe distance for landing varies from 1 to 5 miles depending on the airspace. At an airbase like Smolensk North which may have Soviet fighters using it, a 5 mile visibility is necessary to spot any stray fighters in time to avoid them. Another source notes that –even with an instrument landing system, a half mile visibility is needed before a pilot is allowed to land his plane. One source reports that the day of the crash the Smolensk North airport had a visibility of 400 meters. Other reports on the evening news and radio have mentioned much less visibility as low as 50 or 80 meters. Any sane pilot would not have attempted a VFR landing with that little visibility. The pilot likely made one orbit of the airfield to appease President Kaczynski and to show that the visibility was not good enough to land. Obviously the pilot would not knowingly fly lower than the height of the surrounding hills plus the added height of trees and power lines. If the altimeter were sabotaged, this would be where the plane flew too low and everyone got killed. 1. Diverting the plane would have caused the Polish president to be extremely late for the Katyn ceremony: False. There was an airport with an instrument landing system at Vitebsk, Belarus only 66 miles from the Katyn Forest. The Katyn memorial service was largely ceremonial and only a few hundred people were reportedly at the site. The Polish contingent would have been the most significant group since this included the Polish president, and the press would have waited for them to show up. 2. The Polish president pressured the pilot to land against his will: Disputed. This has been reported as fact even though everyone on the plane is dead and the Smolensk air traffic controller didn’t hear anything that would confirm this. Hopefully the black boxes will shed some light on this. An article notes “In August 2008, Mr Kaczynski had pressed a pilot to land in Tbilisi, Georgia, even though conditions were dangerous during Russia’s short war with the country. After the pilot refused, Mr Kaczynski went into the cabin and later said: ‘If someone decides to become an officer they should not be cowardly.’ The pilot, who diverted to nearby Azerbaijan, was later awarded a medal for refusing to yield to the president. Andrzej Seremet, Poland’s chief prosecutor, told a news conference on Monday that, at this stage of the investigation, there was nothing to suggest pressure was put on the pilots. 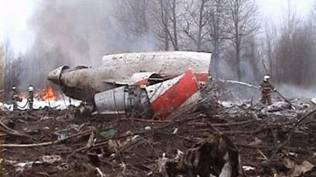 However, the Tu-154’s black boxes were still being analysed to see ‘if suggestions were made to the pilots’.” Judging from the earlier incident, the pilot would have stood to get a medal if he ignored pressure from Kaczynski and diverted the plane to another airport. Also President Kaczynski would have embarrassed himself and gotten bad press if he tried to bully another pilot. 5. The Tu-154 was a flying coffin with a horrible safety record. False. A list of crashes for the Tu-154 since 1994 by FoxNews, show only two previous crashes in Europe. All the other crashes were over Siberia or the the Third World, including two planes shot down and one plane blown up over Europe by Czechen terrorists. Another source notes “On a note about the type of aircraft used, Paul Duffy, an expert on Russian aviation, stated… the hull-loss (crash) rate was normal for the number in service, the number of years it has been operated, and for the technology of the aircraft… 1015 Tu-154s have been built, 214 of which are still in service as of 14 December 2009.” The plane that carried President Kaczynski was only 20 years old and had undergone a major inspection and overhaul in December 2009.